Britain's David Haye made the first defence of his European cruiserweight title with an eighth-round stoppage of Denmark's Lasse Johansen in London. Having controlled the first three rounds, Haye allowed Johansen to fight his way back into the contest. But the 25-year-old regained his composure to unleash a flurry of unanswered punches in the eighth round. With Johansen reeling, referee Guido Cavalleri ended the contest two minutes and eight seconds into the round. Haye was finding it easy to land almost at will in the early stages of Friday's encounter at the York Hall, Bethnal Green. He came out fast at the start of the second round, catching the challenger with a hurtful two-fist combination and the gap in class was immediately obvious. Haye did not even bother with the stool between rounds and he continued to punish the Dane, countering accurately as the challenger plodded forward. But despite his good start, Haye was taken in to unchartered territory, having not gone beyond five rounds in his 16 previous fights as he let his opponent battle back into the fight. Haye, who had struggled to make the 14st 4lb cruiserweight limit and had to make two trips to the scales, appeared to drop the pace in the middle rounds. Johansen started to enjoy some success, with his own two-fisted flurries. I know I can blast people out but I wanted to prove I can do the rounds. But when a vicious attack from Haye opened a cut at the corner of his left eye in round seven things looked ominous for the challenger. A round later, Haye suddenly cut loose and as Johansen again shook his head the referee decided he had seen enough and halted the blood-letting. 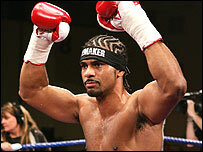 Haye said: "He was a tough opponent but that is exactly what we wanted. "I was not looking at banging him out. I expected and trained for a 12-round fight." Haye denied, however, that he had stamina problems: "I have done a lot of work on my defence and was taking my time in there. "It's a different side of me. I know I can blast people out but I wanted to prove I can do the rounds." Haye revealed he will stop battling the scales as soon as he wins a world title. "Then I will move up to heavyweight. It is getting hard," he admitted. "I was struggling to get the last pound off and was worried at the weigh-in. I had to put the sweat suit on and run round the park to shift it." Frank Maloney, promoting Haye for the first time, said: "We said we would bring him to London and make him a star. "Then we will make him a star on the world stage. "I know David wants to fight for a world title as soon as possible and we will get him the fight when the time is right."